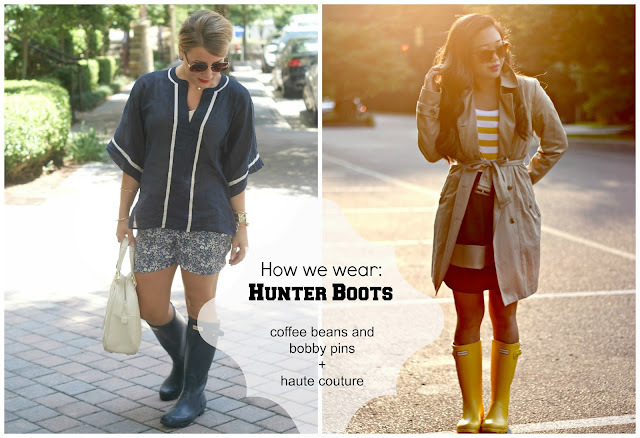 Today I'm teaming up with Amy of Coffee Beans and Bobby Pins to show you how we style our Hunter rain boots. I'm so excited about this collab for so many reasons. 1. I love Amy's style and outfits. She always looks so polished and chic, and I love how she accessorizes. 3. Rainy day looks are my favorite. Seriously, I wear out the name 'Rainy Day Chic'. Due to the drabby and gloomy weather that rain brings, I like to spruce things up by layering and mixing bright colors. P.S. I wear a size 6 in shoes so I ordered the Big Kids rain boots from Nordstrom. It's still pretty big and not as pricey as the women's rainboots.